Easy installation. Fits almost any door - includes adjustable latches for 2-3/8" & 2-3/4" back sets. Lifetime mechanical and finish warranty. See warranty details at www.weiserlock.com or contact consumer services at 1-800-501-9471. The Schlage Single Cylinder Deadbolt and Keyed Entry Accent Lever in Satin Nickel is perfect for use on exterior doors, with the deadbolt adding an extra layer of security to the lever. The Accent lever is widely popular for its elegant wave-like design that effortlessly matches a room's style without overshadowing it especially when finished in Satin Nickel. Plus, it's been designed and tested with strength and durability in mind. The Schlage Accent Lever with Camelot Trim Keyed Entry Lock in Satin Nickel unlocks when the door is opened from the inside, allowing you to leave quickly and conveniently, and re-enter easily. The Accent lever is widely popular for its elegant wave-like design that effortlessly matches a room's style without overshadowing it, while the Camelot trim's scalloped architectural details make any room charming and approachable especially unlocks when wrapped in our versatile Satin Nickel finish. Plus, it's been designed and tested with strength and durability in mind. 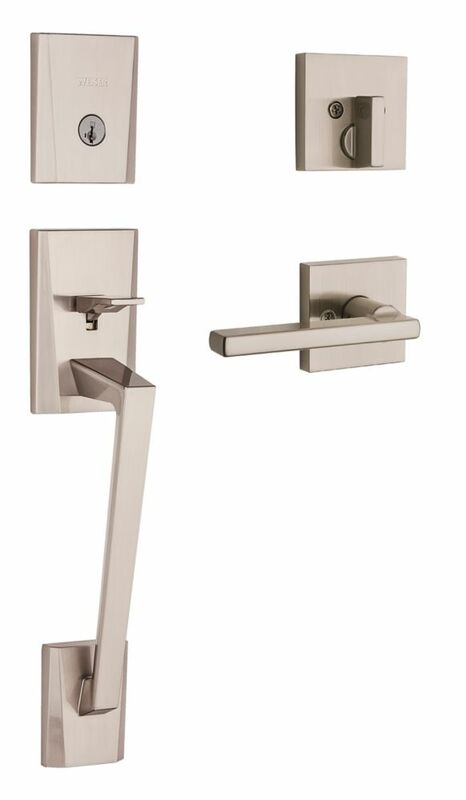 Camino/ Halifax in Satin Nickel The Camino handleset makes a bold statement with its faceted, geometric shape. This handleset includes a low-profile deadbolt and SmartKey Technology, which allows the homeowner to re-key their lock in seconds. Camino also features an adjustable screw that allows for easy door mounting and a guaranteed fit. The crisp, clean appearance of the Satin Nickel finish adds to the overall look of the product and brings a modern feel. Camino/ Halifax in Satin Nickel is rated 5.0 out of 5 by 1.